Bringing together exclusive crafts from across the sub-continent under one roof, is Kunal Sachdev with his venture, Caravan. Started barely two months ago, it is not only the newest retail destination at the upscale Phoenix MarketCity but caters to your home and decor needs as well. Sachdev sources handmade products from West Bengal, Imphal and Cuttack to neighbouring Bidar and Channapatna. His team then works with artisans to add contemporary sophistication to these products. a�?There is no dearth of skills and craft forms in this country. But craftsmen do not know how to cater to the modern Indian, rendering their products redundant. Thata��s where we come in,a�? Sachdev, former CEO of Hidesign, says, adding, a�?Most of the artisans have no idea what the market trends are so we help them create products designed by our team.a�? Designed by an in-house team, the cotton apparel includes high-low hemlines, kurtas that double up as dresses, embroidered cotton shirts, stoles and tie and dye blouses. The line has been sectioned into five distinct collections a�� Classic, in shades of indigo and white for office wear, Core, in popular silhouettes and blacks and beige, Floral with hand-painted kalamkari tops and palazzo pants with silk borders. Then there is Occasion a�� a�?a watered down version of traditional Indian evening weara�� like angarkas in hues of wine and mustard, and Kitschy a�� a range of colourful ensembles. 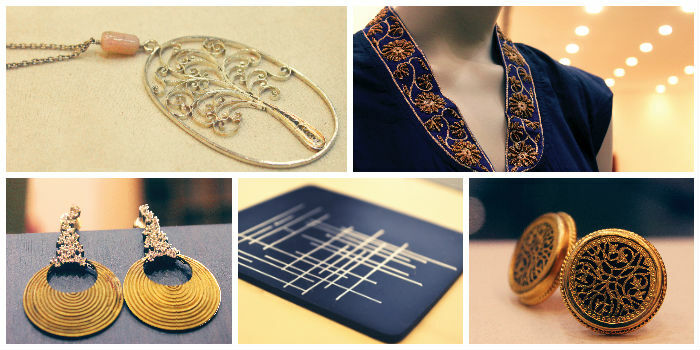 Their jewelry line, managed by Mahesh S Rao of Carbon, showcases bidri, filigree, thewa and dhokra forms to complement the garments. We loved the limited edition dhokra collection of brass, silver and cubic zirconia. And pure silver filigree pieces crafted by artisans in Karimnagar, Cuttack. The bidri ware, with silver inlaid work and contemporary motifs from Bidar, has been a special hit with expats and tourists especially their collection of coasters, tea-light holders, trays and photo frames. a�?The Caravan products are handcrafted, not handicrafts. Meant to resonate with the well-travelled, well-heeled, discerning shopper who is design conscious,a�? Sachdev explains. Their home linenA�includes combinations of zardosi with block prints, handwoven kota, shibori and silk fabrics in pastel blue, pink and green. For a splash of colour, their Channapatna candle stands are a good buy, much like the Channapatna toys designed by Michael Foley of Titan, with muted shades and natural wood tones coming through in most.